“I am ready to die [for Egypt]…and meet God for what I have done,” said Egypt’s President Abdel Fattah Al-Sisi in a live address after a meeting with the country’s top military brass. Egypt’s Sisi said Egypt is in a “difficult, strong and evil confrontation” which will take a long time to be resolved, in his first national address after the latest deadly Sinai attacks. At least 30 people were killed and 50 others were injured late Thursday in four separate attacks against security installations in the governorate. Sisi said he could forsee such attacks hitting the country since the military ouster of Islamist President Mohamed Mursi in July 2013, following mass protests against his rule. He said he met with a leader of “the organisation” on June 21, 2013, in reference to the banned Muslim Brotherhood. “He told me, you will find people coming to fight you from all around the world,” Sisi said. 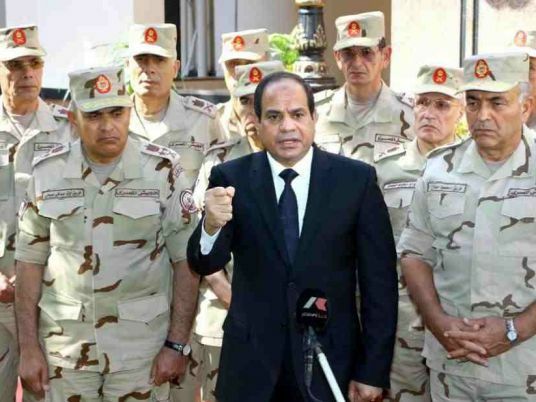 Sisi had demanded a mandate to “combat terrorism” in July 2013. Two days later, thousands of Egyptians took to the streets nationwide in anwer to his demand. “This was your decision, people of Egypt,” he said. The statement comes following Sisi’s meeting with the Supreme Council of the Armed Forces (SCAF) since today morning following the deadly attacks in Sinai which left at least 30 dead. Sisi cut short his trip to Ethiopia on Friday after the attacks. The president was heading an Egyptian delegation attending the African Union Summit in Addis Ababa. Addressing the Thursday attack, Sisi said on Friday that Egypt is “paying the price” for fighting terrorism and extremism, state-run MENA reported. The attack is the deadliest since a similar one on the Peninsula last October. At least 30 military personnel were killed in a suicide operation which targeted a security checkpoint in Sinai’s Sheikh Zuweid on October 24, 2014. Following the October attack, Sisi declared a three-month state of emergency and a night-time curfew in parts of Sinai. The curfew was extended for three more months last week; it is due to last until April 25. Egypt’s cabinet also issued a decision to clear 500 metres of Sinai’s border area to create a “buffer zone”, in response to the October attack. The area was doubled to 1,000 metres in November, 2014. Egypt’s most active militant group, Ansar Bayt al-Maqdis, claimed responsibility for Thursday’s deadly attack, as well as last October’s attack. The group changed its name to Sinai Province after pledging allegiance to Islamic State fighters in Syria and Iraq last November. Militants have stepped up attacks targeting security forces in Sinai, as well as other parts of the country, since the military ouster of Islamist President Mohamed Mursi in July 2013, which followed mass protests against his rule.